Satellite project window installation at ATA (Artists' Television Access) on Valencia at 20th streets. Wilson created a window installation at ATA (Artists Television Access) in San Francisco’s Mission District that featured a timeline spanning the 50 years, capturing the trajectory of pop-culture and dissidence masked as a marketing tool for private profit. 1967: Youth culture comes to represent a new order of consumption that uses the aesthetics and ethos of dissidence and revolution as tools to sell products that represent change and forward thinking. 1971: "I'd Like to Teach the World to Sing (In Perfect Harmony)" released as an ad for Coca-Cola, featuring a multicultural teenagers on top of a hill singing. 1976: Apple Inc. founded by Steve Jobs, Steve Wozniak, and Ronald Wayne in the garage of Job’s childhood home. 1991: World Wide Web is released to the general public. 1997: “Think Different” Apple commercial featuring black-and-white footage of iconic 20th century personalities including: Bob Dylan, Martin Luther King, John Lennon and Yoko Ono, Muhammad Ali, Maria Callas, and Mahatma Gandhi. 1997 – 2001: Dot-com bubble that resulted in thousands of lower and middle-income Bay Area residents being evicted and/or forced to leave the area due to the increasing costs of living. 2000 – 2002: Dot-com collapse. 2001: President Bush tells America to go shopping after 9/11. 2008 – Present: Rise of the ‘Sharing Economy’ (e.g. Uber, Lyft, AirBnB) business model and marketing campaign to match technology with the image of a greater social good and a new model for moving forward. Rather, the “Sharing Economy” uses the same capitalist model that has been operating throughout the industrial/technological revolution: exploit labor and deregulate to maximize the profits for investors. 2011 – Present: Increase in the use of arts/ branding/ creative placemaking as gentrifying forces through an increase of national, regional, and local funding support and public-private partnerships. 2011: “Twitter/Tech Tax Breaks” passed by the San Francisco Board of Supervisors. San Francisco lost $30 million in 2014 alone due to these tax breaks. 2012 – Present: Urban Prototyping, Innovating, Disrupting = marketing tools for gentrification and advancing a neoliberal agenda. 2013 – Present: Private tech shuttle buses begin using public city bus stops, creating increased delays for public transportation. 2014: Privatization of public park space best exemplified when the SF Parks & Rec department began requiring reservations to be made online to use the Mission Playground Soccer field. 2016: One billion Apple devices active worldwide. 40,000 children work in cobalt mines in the Democratic Republic of Congo to support the manufacturing of tech devices sold by companies that include Apple, Microsoft, and Vodafone. 2017: 45,000 Uber and Lyft drivers competing on the streets of San Francisco daily, creating massive carbon emissions and major traffic jams. 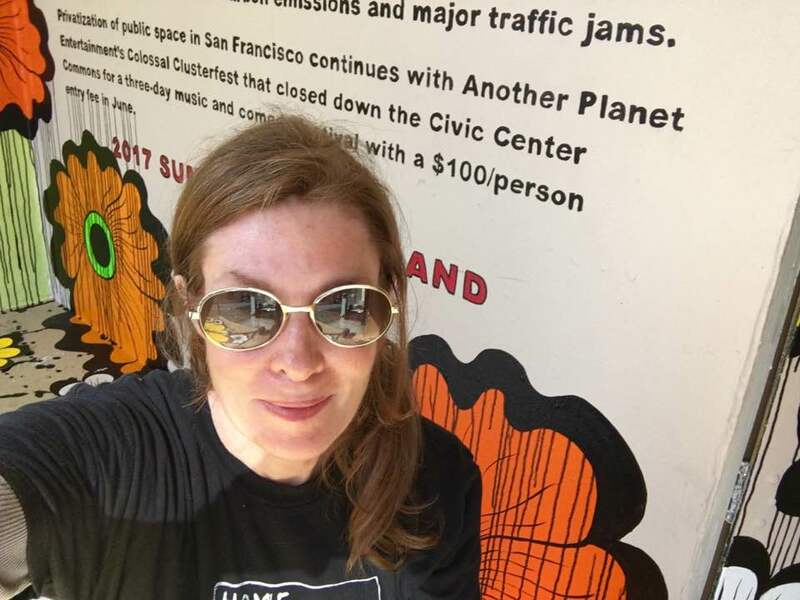 Privatization of public space in San Francisco continues with Another Planet Entertainment’s Colossal Clusterfest that closed down the Civic Center Commons for a three-day music and comedy festival with a $100/person entry fee in June.